As part of the MN Opera’s opening gala, there will be a silent auction where donors can bid on art created by local and regional artists. The artists must use opera glasses (provided by the Opera) in their work. I was selected to be one of the artists for this event, and I’m really excited about it. After looking through the schedule for the Opera’s performances this year, I saw Madame Butterfly on the list, so I’m using that as my inspiration. I went to Goodwill and Savers in Bloomington and found some really cool items to use, including a Chinese lacquered panel with butterflies, an actual wooden Geisha shoe (strangely enough it is a real worn shoe with a shoe size sticker and it was located in the housewares section for some odd reason), and a lacquered vase with a peacocks and a butterflies on it. I painted the opera glasses and am adding some embellishments to it, and then I’ll affix it to a mask with an asian brocade fabric and add some peacock feathers to it. So it’ll be a sort of masquerade Geisha theme in the end. Depending on how things turn out, I might use the lacquered panel in the MN Opera work or I may keep it. Any work I give to the Opera is a donation of my time and money, so I need to be careful with how much I spend on it. Either way, it should be a lot of fun. I’ll post pictures as my work evolves. 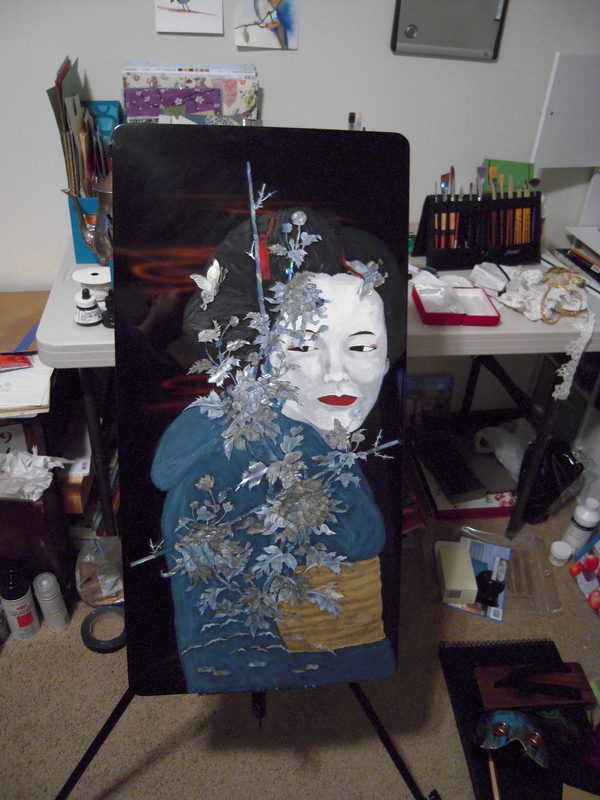 Here’s what I have so far: the lacquered panel now has a Geisha.